One of four Spirit class ships, Carnival Miracle made its magical debut in 2004. 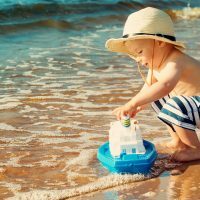 While it’s certainly not Carnival’s grandest ship, it’s definitely something of a “miracle” for families, who find an ample amount of amenities and activities on board. Amid a gaudy, Las Vegas nightclub-like atmosphere (which we don’t particularly love), there’s everything from a kid’s pool and club for tiny tikes to a casino and spa for mom and dad. The ship was renovated in 2012 to include a taste bar (with a complimentary appetizer program) and The Punchliner Comedy Club and Comedy Brunch Presented by George Lopez. Carnival Miracle’s rooms are simple, yet comfortable and clean, with flat-screen TV’s, phones, complimentary bathrobes and stocked mini-bars. Anything consumed from the mini bars, which offer alcohol, sodas and energy drinks, will cost you an extra fee. Housekeeping will bring ice to your room as often as you prefer. They’ll also clean your room and make the bed in the morning, and provide turn-down service at night; this includes the famous towel animals (our favorite was a monkey hanging from the ceiling), chocolates and a copy of the Fun Times. These units are small, with two twin beds that can easily be converted to a king bed. They have a desk and chair, three closets and a small bathroom with a shower. They’re suitable for mom and dad, but not for an entire family. Ocean View rooms are almost identical to Interior rooms, but offer a window. They include two twin beds that can convert to a king bed, a desk and chair, three closets and a small bathroom with a shower. Each unit includes two twin beds that convert to a king bed, a small bathroom with a shower, a vanity area with a large mirror and a sofa with a coffee table. These units are more expensive than standard Interior and Ocean View rooms, but they’re well worth the cost. The balconies, which offer two chairs and a small table, provide a peaceful retreat. While the kids are at Camp Carnival, drink champagne and watch the sun set over the sea. The balconies are generally childproof (with high, concrete-filled railings), but supervision is obviously advised when the kids want to explore this part of the room. Balconies come in slightly different sizes (standard, extended and premium), and some feature an ocean view, while others offer an obstructed view. It’s worth noting there is only one outlet in each Balcony room. Well, technically, there are two, but one is a European outlet. There’s also an outlet near the ceiling in the bathroom, but it’s low-voltage and designated for shavers only. Suites come in four different variations: Junior, Grand, Ocean and Vista. Each style is generally similar, though the Grand and Ocean suites have large balconies, and the Vista has a wrap-around balcony. In each suite, two twin beds convert to a king bed. Suites feature full bathrooms with showers, Whirlpool tubs and double sinks, as well as sofas, armchairs, coffee tables, walk-in dressing areas, vanity tables and two closets. During the cruise, I quickly learned that cruise food is every bit as big of a deal as the cruise itself. And when it comes to dining, the Carnival Miracle does not disappoint. 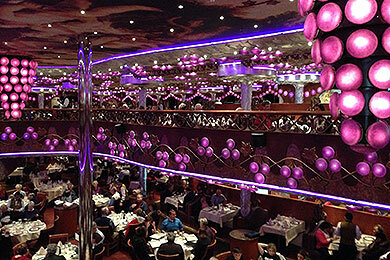 Thousands of purple, bubble-like lights embellish Bacchus Restaurant, where most guests dine each night. Much of the menu changes nightly, except for a list of standard fare like fried chicken, burgers and grilled salmon. Each night, the menu also lists a “Didja Ever?” option, which features wacky samples of frog legs, alligator fritters and shark! Kids menu options include chicken nuggets, hot dogs and macaroni and cheese. You’ll have two options for dining at Bacchus, typically arranged at the time of your cruise booking. You can choose Assigned Dining or My-Time Dining. We suggest My-Time Dining, as it enables you to eat dinner anytime between 5:45 and 9:30 p.m.
Bacchus also serves brunch, and I highly recommend it, as well as the Comedy Brunch. The best part of this meal is that you’ll be placed at a table with other guests you don’t know. This was one of my favorite experiences on the ship. 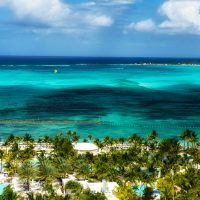 We met a couple from Canada, who told us about their cruise adventures, as well as other first-time cruisers from Cape Cod. Breakfast, lunch and late-night snacks are offered at Horatio’s, which resembles a food court. Breakfast is served buffet-style, with separate bars for fresh fruit, pastries and cold cereals, and hot items like made-to-order omelets, pancakes, potatoes and oatmeal. Coffee, tea, water, apple juice and orange juice are served at a separate bar. Lattes, espressos and the like are available at the coffee bar just inside the entrance of Horatio’s (additional charges apply). For lunch, some items are served buffet style, while others are made to order. Guests enjoy Carnival Deli and Pizza Pirate, as well as a salad bar, Chinese buffet and pastry bar. Two other bars offer a daily special, such as French food or Caribbean-inspired food. For drinks, water, iced tea (unsweetened) and lemonade are served. Late-night snacks include hot dogs, hamburgers and French fries. Pizza Pirate is also open for made-to-order pizza. We admit it’s not the best pizza, but the kids might love it. Horatio’s also offers specialty foods and buffets on certain days. For example, a Mexican buffet was served late one night, and on the last day of our cruise, the staff set up a Chocolate Extravaganza Buffet with a fondue fountain! Needless to say, it’s one of the ship’s highlights. Enjoy a soft-serve ice cream cone at this small shop. Flavors include chocolate, vanilla and twist. Coffee and tea are also served here. Treat yourself to a latte, espresso or cappuccino at Fountainhead Cafe, located in the lower promenade area. Extra fees apply. A newer feature on the ship, the Taste Bar offers free appetizer samples, including roasted pork tacos with chili salsa and short rib croquettes. Room service (and tips) are included in your fees, so feel free to order as often as you like! Room service for breakfast is especially convenient on days you plan to take shore excursions. Breakfast consists of cold items, such as cereals, fruit, yogurt and bagels. 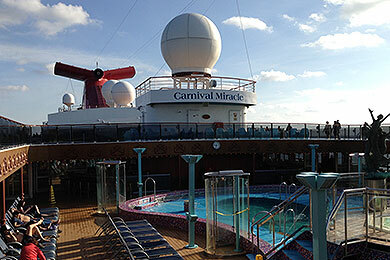 Carnival is known for its plethora of onboard activities, and the Miracle is no exception to this. Listed in the Fun Times, the ship’s daily newsletter, activities include beanbag tosses, trivia, bingo, games, dance classes (including a “Thriller” class) and Camp Carnival, the ship’s kids club. Camp Carnival offers designated activities to kids in three different age groups: 2 to 5, 6 to 8 and 9 to 11. Meals are also served, and include favorites like chicken nuggets and macaroni and cheese. At night, kids gather for the Carnival Night Owls program (offered for an additional fee), where they get to stay up late while mom and dad enjoy a night out. Other events include a Hairy Chest Contest (the whole family will laugh at dad for this one! ), mixology competition, and singles meet-ups for all age groups. Even if the ship didn’t offer organized activities, you couldn’t possibly be bored. Located at the top of the ship, a life-size chess set, kid’s pool and giant waterslide await families. Beneath the waterslide is a new adults-only area, which features lounge booths (more like beds with shields that partially block the sun), a bar and a pool. Another large pool with a hot tub can be found toward the middle of the ship, and is surrounded by lounge chairs, tables, a bar and a stage. If you’re thinking what we’re thinking, yes, you can sit in the hot tub just feet away from the stage as a live band performs. At the front of the ship, you’ll find a mini-golf course encircled by an outdoor running track. Directly beneath it is the fitness center, which includes several cardio machines and a limited selection of free weights machines. It also includes separate steam rooms and saunas for men and women. At night, you’ll be entertained by live shows, performed by the ship’s singers and dancers. Kids will especially like the family-friendly comedy shows held at the Mad Hatter’s Ball. They’ll also like the Legends show, held on the last night of the cruise. This show features guests from the ship performing as musical icons such as Elton John, Aretha Franklin and Elvis Presley. Seemingly geared toward 20-somethings, Dr. Frankenstein’s Nightclub is a two-floor venue with two bars, tables and chairs and, of course, a dance floor. 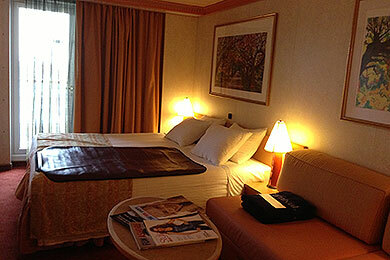 Carnival ships feature Sail & Sign cards, which make life so much easier. All you do is link a debit card or credit card to your Sail & Sign Card at Guest Relations or a kiosk on the ship. You’ll then use your Sail & Sign card for any purchases you make on the ship, such as souvenirs, activities with extra fees, drinks, casino games and even excursions. Instead of tipping your waiters and housekeeping, Carnival Miracle charges a one-time gratuities fee of 92.50 per person. This fee can be paid in advance, or it will be charged to your Sail & Sign account. Carnival allows each guest to bring one bottle of wine on the ship. We suggest a bottle of wine with a twist-off cap, as Carnival charges an extra fee to uncork the bottle. Other alcoholic beverages are not permitted, but can obviously be purchased throughout the ship. Each day, the ship features a drink special, often served in a souvenir glass. Don’t forget to pack seasickness medicine. You might not need to use it, but it’s good to have just in case. Ginger candies also help to calm an upset stomach. Additionally, we suggest packing extra hangers for clothing. The ship provides 10 or so. A big business on Carnival is pictures. 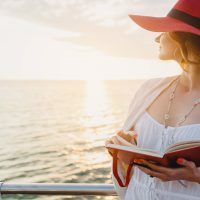 Be prepared to get your picture taken several times before you board the ship, leave for excursions, at dinner and when you disembark from the cruise. You certainly don’t have to buy them (though they make for a nice souvenir%2529, but the staff will encourage you to smile for the camera! Nick and Nora’s is not included in the ship’s meal plan, but is well worth the $35 per person-rate it charges. It’s not a place for kids, so send the kids to Camp Carnival and prepare for an extravagant meal. The dim-lit, fancy steakhouse offers better food than the other eateries on the ship (though the food at those places is still very good! ), and is some of the best food we’ve ever had. The steak is excellent, and the Surf and Turf is even better. You MUST try the cheesecake – period. As an added bonus, you’ll receive a complimentary bottle of wine if you make reservations for Nick on Nora’s on the first night of your cruise. Each day, Carnival Miracle Spa and Salon offers a special promotion, though we feel the costs are still overpriced. If you’re willing to splurge a bit (and since you’re on vacation, you should! ), you’ll have the option to enjoy several massage choices, including full body; scalp; ankle, foot and hot stone; as well as skin exfoliations, scrubs and facials. Manicures and pedicures are also offered. 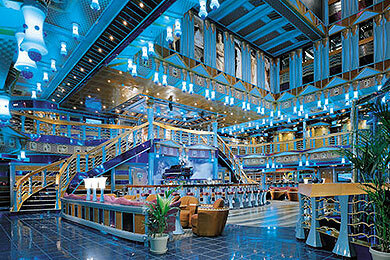 Several bars are located throughout the ship, including a lobby bar with live music, a piano bar and a sports bar with karaoke (which also allows smoking). The ship’s casino is extensive, with blackjack, roulette, poker, craps, slot machines and tournaments. After a few rounds of blackjack, head to an adults-only comedy show at the Mad Hatter’s Ball, typically held at 9:45, 10:45 and 11:45 p.m. on several nights of the cruise.